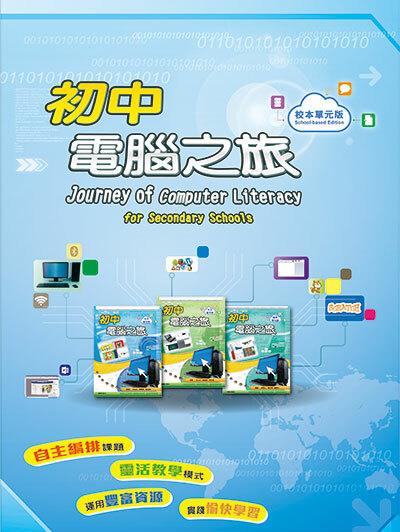 "Journey of Computer Literacy for Secondary Schools (School-based Edition)" is newly published according to the most recent curriculum guidelines of Computer Literacy issued by the Curriculum Development Council of the Education Bureau. This new school-based edition covers three learning areas (Computer Systems, Information Technology and Computer Programing) and new enrichment modules. This series is suitable for Secondary 1 to 3 students. 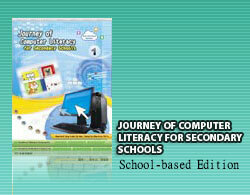 Complemented with “Journey of Computer Literacy for Secondary schools (School-based Edition), this workbook has been carefully tailor-made for students to provide consolidation and assessment on what they have learnt. The completion of the exercises in the workbook can enhance students’ understanding of the basic knowledge of each unit, consolidate their learning and encourage extended learning. The workbook provides various types of exercises for students such as: vocabulary review, matching, true/false questions, multiple-choice questions, fill-in-the-blank questions, diagram labelling, case study, activity zone and practice zone. * Vocabulary Review: It allows students to revise the vocabulary of each unit and helps them apply computer and information technology in their daily lives. * Matching, True/False Questions, Multiple-Choice Questions, Fill-in-the-Blank Questions, Fill-in-the-Blank Questions, Diagram Labelling: They clarify basic concept and commonly confused concepts so that students can reinforce what they have learnt. * Case Study: It provides opportunity for students to think the computer-related issues in depth. * Activity Zone and Practice Zone: They provide ample opportunities for students to apply what they have learnt in their daily lives and broaden their horizons.